Organizations around the world always want to reach their customers on time. Smartphone helps organizations to interact with their customers instantly. Custom mobile applications boost the functions and performances of the smartphone. 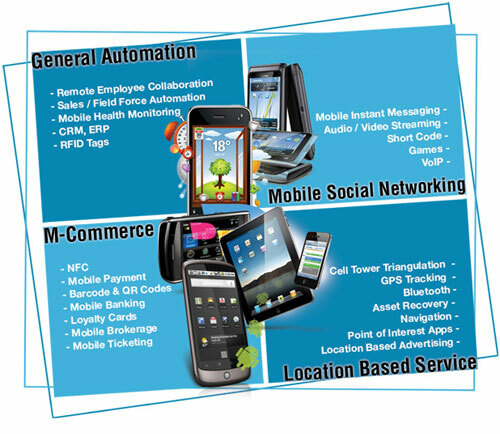 We at INJ Software Solutions develop customer-centric mobile applications for various platforms. Some of our mobile applications are successfully used in GPS, Social networking, group deal sites, deals aggregator, maps, game applications, payment gateway, shopping cart etc. INJ Software Solutions team has sound experience and expertise in developing highly interactive mobile applications using the latest operating systems that are extremely user-friendly and functional. We create value-added mobile apps on various platforms as per your specific needs. We provide services to develop all kinds of apps including business apps for asset tracking, air ticket booking, GPRS road map, vendor apps, 3D games apps, social application apps etc. Our dedicated team will meet your needs with fast turnaround time in a cost effective manner. INJ Software Solutions mobile apps developers are well-versed in all latest technologies to develop the mobile applications to your custom requirements. By making your web applications accessible on different leading mobile platforms, you can attract and retain more customers thus increase your profit. We are field expert in developing the cross platform mobile apps that will suit to different platforms. Cross platform development reduces the technical barriers with less time to develop the apps. We provide apps development across all the industry verticals. We take extreme care to design the apps with best user interface that allows the users to access the contents intuitively. You will find our apps development highly inventive and creative with best logics and design. All our games can make you addictive. Our mobile application development will be worthwhile for your investment providing the maximum ROI. There is no limitation for the variety of apps that we develop with unique features. You will find a cohesive atmosphere with us for developing your mobile applications. We make your apps matching to your vision and concept in your mind. We strive to bring your apps to reality.